Wharton Club members & their guests are invited to this Headliners Luncheon at National Press Club with Lance Fritz, the chairman, president and CEO of Union Pacific. He will discuss trade, technology and his insights into the economy. Founded in 1862 by Abraham Lincoln, Union Pacific Railroad hauls 70 percent of the U.S. freight rail volume into and out of Mexico, and 40 percent of its overall traffic either originates or terminates outside the U.S. The company has a market cap of about $106 billion (NYSE: UNP) and annual revenues of over $21 billion. Lance Fritz, the chairman, president and chief executive officer of Union Pacific, will discuss trade, technology and his insights into the economy at a National Press Club Headliners Luncheon on Thursday, July 12 on the 7th floor of the National Press Building. 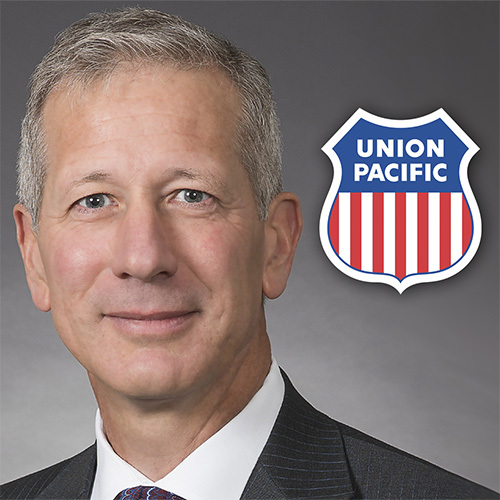 Fritz began his career at Union Pacific as a vice president and general manager in the company’s marketing and sales department nearly 20 years ago. Fritz went on to serve in various executive roles including chief operating officer before becoming president, CEO and chairman of the board in 2015. Prior to joining Union Pacific, Fritz worked for Friskars, Inc., Cooper Industries and General Electric.